Since 2008 these two veteran performers have brought their unique brand of clean and hilarious musical comedy to audiences across the US proving night after night that comedy can be smart, friendly, and breathtakingly funny without being vulgar or pejorative. This is a show for anyone who wants to laugh, whether it’s a group of friends or a family gathering, and feel good on their way out of the venue. 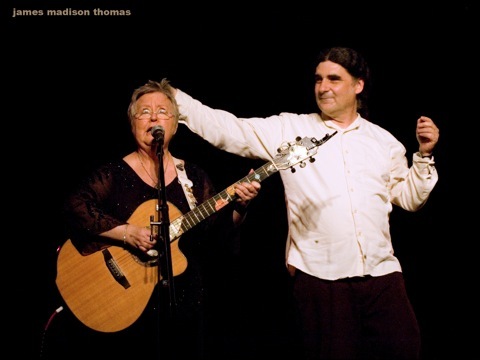 Since emerging from the NYC singer/songwriter scene in the late 1980s, (along with Suzanne Vega, Shawn Colvin, John Gorka, etc), Lavin quickly established herself as an entertaining tour de force. Quick on her feet, witty, insightful, engaging, she remains one of the most popular and respected performers in the genre. Christine has also been at the forefront of finding and promoting extraordinary new talent. She founded a songwriter’s retreat on Martha’s Vineyard, the On a Winter’s (and Summer’s) Night tours), The Four Bitchin’ Babes, Laugh tracks among many other projects, in the process releasing more than 10 compilations CDs, as well as more than 20 of her own. A product of the rich Boston Arts Scene of the 90s Don developed his songwriter/performer chops in the same Club Passim/ Olde Vienna Kaffehaus scene that produced Dar Williams, Martin Sexton, Lori McKenna and Vance Gilbert. He was also a regular comedian at the legendary Catch a Rising Star in Harvard Square in Cambridge, Mass honing his comedic skills alongside Jimmy Tingle, David Cross, Wendy Leibman and a host of other cutting edge comics of the time. These experiences along with his immersion in the Boston spoken word scene that produced the National Poetry Slam Championship Team in 1992 all combined to make him one of the few performers who brings a comic’s wit, and a poet’s heart to his songs and stories. Audiences are looking for something fun, fresh, smart, and intriguing as well as thoughtful: On the Funny Side of the Street does just that.